Today's global politics are rife with contradictory trends. On December 12, 195 nations adopted the Paris climate agreement, which is very strong on goals and process if lacking in binding limits on greenhouse gas emissions. Also on the positive side, the agreement with Iran on curbing its nuclear program strengthens the non-proliferation regime and affords an opportunity to turn attention to the elimination of existing nuclear arsenals as well as prevention of their spread. Yet in many other ways the world is in turmoil, with the horrific attacks on a Russian airliner and in Paris, Beirut, Nigeria, and Mali, and the deep US-Russian tensions over Ukraine and Syria as well as US missile defense and non-nuclear global strike programs. Former Defense Secretary William Perry has warned that a new nuclear arms race between the United States and Russia is emerging, including a possible resumption of nuclear testing. In fact, the rise of insurgencies engaged in extreme anti-civilian violence, and the geopolitical confrontations among the world's most powerful states, are themselves compelling reasons for expeditious nuclear disarmament. And at the United Nations, states free of nuclear weapons are pushing hard for just that. Pope Francis added his powerful voice, and the Marshall Islands as well through its Nuclear Zero cases. We are proud to be part of the Marshall Islands' international legal team. For more, see this eNews. And please include LCNP in your end of the year donations - we definitely depend on the support of individual donors. Click the Donate Now button or send a check to LCNP at the address at the end of this eNews. 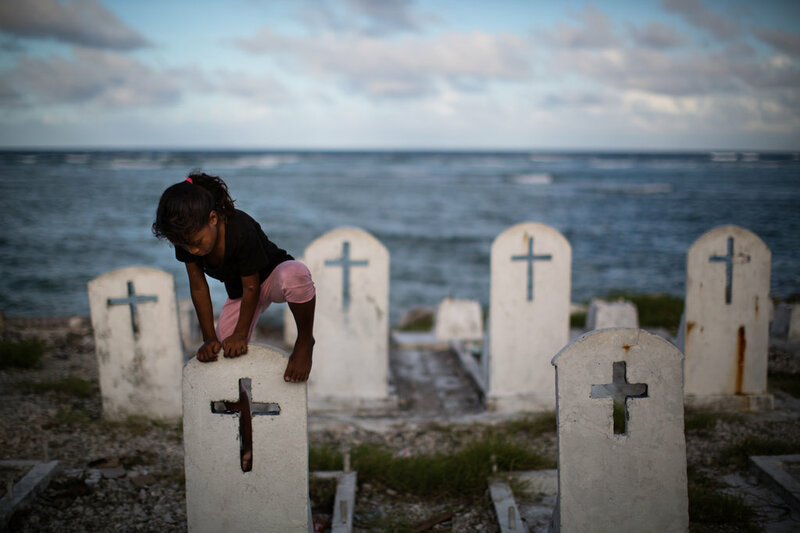 Eroding seaside cemetery, Marshall Islands. Image: New York Times. We believe there are deep connections between climate protection and the abolition of nuclear weapons. Both require global legal and political processes. And climate change will cause conflict, while disarmament will promote the cooperation needed for climate protection. See this very timely publication from the World Future Council: The Climate-Nuclear Nexus: Exploring the Connections Between Climate Change and the Nuclear Threat. Our longtime colleague J urgen Scheffran is the principal author; LCNP Executive Director John Burroughs is a contributing author. A Disarmament Times article on the same theme focuses on the role of the Marshall Islands, a champion of both climate protection and nuclear disarmament. Tony deBrum, Foreign Minister for the Marshall Islands, was much in the news during the Paris negotiations. See this Guardian story on the "high-ambition coalition," and this New York Times story, "The Marshall Islands Are Disappearing." Pope Francis made a profound point in his remarks at the UN on September 25: "An ethics and a law based on the threat of mutual destruction - and possibly the destruction of all mankind - are self-contradictory and an affront to the entire framework of the United Nations." He went on to say: "There is urgent need to work for a world free of nuclear weapons, in full application of the non-proliferation Treaty, in letter and spirit, with the goal of a complete prohibition of these weapons." The incompatibility of 'nuclear deterrence' with the UN Charter is a thesis that LCNP has been advancing in recent years. The 2011 Vancouver Declaration, released by IALANA, LCNP's international body, and The Simons Foundation, and signed by many international lawyers, states that "reliance on 'deterrence' as an international security mechanism is far removed from the world envisaged by the UN Charter in which threat or use of force is the exception, not the rule." See also Burroughs' 2012 article in the Cadmus Journal, "How Reliance on Nuclear Weapons Erodes and Distorts International Law and Global Order." In additional to its highly visible role in the climate negotiations, the Marshall Islands is playing a leading role in the movement for the abolition of nuclear weapons with its cases in the International Court of Justice (ICJ) claiming breach of the obligation to negotiate nuclear disarmament. The Marshall Islands' determination grows out of its experience with nuclear detonations, documented by this excellent Washington Post story by Dan Zak, "A Ground Zero Forgotten". On November 30, the Right Livelihood Award was given to Foreign Minister Tony deBrum and the People of the Marshall Islands "in recognition of their vision and courage to take legal action against the nuclear powers for failing to honor their disarmament obligations under the Nuclear Non-Proliferation Treaty and customary international law." In his acceptance speech at the Swedish Parliament , deBrum said: "I have seen with my very own eyes [nuclear] devastation and know with conviction that nuclear weapons must never again be visited upon humanity. This is not just an issue of treaty commitments or international law, though it is that, and not just an issue of ethics or morality, though it is that too, but this is an issue of common sense - how could any one common person walking down the street ever permit the possession or use of such weapons?" LCNP Consultative Council member Roger Clark, LCNP President Emeritus Peter Weiss, and John Burroughs are members of the Marshall Islands' international legal team before the ICJ. 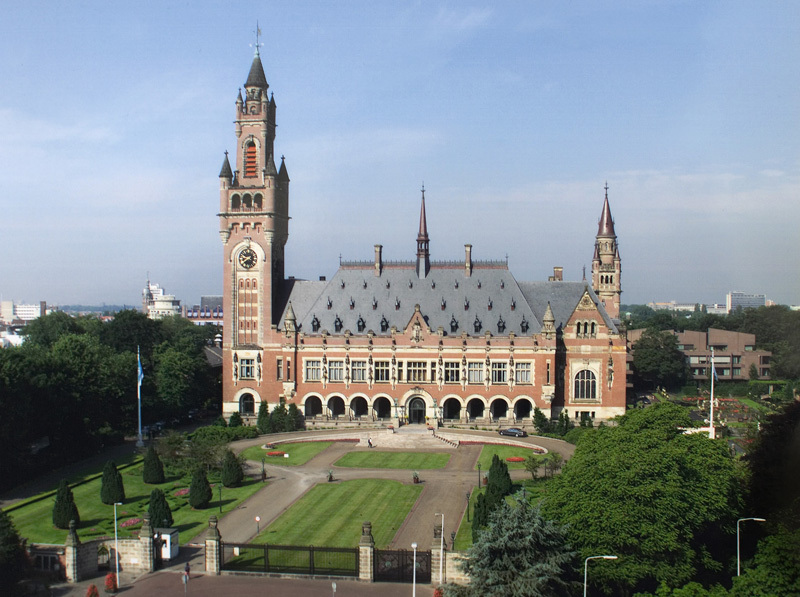 We are now preparing for the hearings, to be held in The Hague from March 7-16 and open to the public, on preliminary issues relating to whether the cases against the UK, India and Pakistan are suitable for adjudication on the merits. For more information, see www.lcnp.org/RMI and www.nuclearzero.org. In early November, the General Assembly's First Committee, which deals with international security and disarmament, adopted no less than three new resolutions addressing the humanitarian consequences of nuclear explosions, carrying forward the initiative centered on governmental conferences in 2013 and 2014 in Oslo, Nayarit, and Vienna. They are: Humanitarian consequences of nuclear weapons; Humanitarian pledge for the prohibition and elimination of nuclear weapons; and Ethical imperatives for a nuclear-weapon-free world. Another new resolution was Universal Declaration on the Achievement of a Nuclear-Weapon-Free World, put forward by Kazakhstan. The Permanent Five was not supportive. The United States voted against all four resolutions, as did Russia, the United Kingdom, and France; China abstained. The "Ethical imperatives" resolution, whose lead sponsor was South Africa, the only country to give up an indigenous nuclear arsenal, states that "it is inconceivable that any use of nuclear weapons, irrespective of the cause, would be compatible with the requirements of international humanitarian law or international law, or the laws of morality, or the dictates of the public conscience." Music to our ears! For related commentary, see " Legal Gap or Compliance Gap? ", published by Burroughs and Weiss in Arms Control Today. The First Committee also adopted a resolution sponsored by Mexico and other states to establish an Open-Ended Working Group (OEWG) to take forward multilateral nuclear disarmament negotiations. The Permanent Five opposed the resolution. Open to all UN member countries and also to civil society, it will "substantively address concrete effective legal measures, legal provisions and norms that will need to be concluded to attain and maintain a world without nuclear weapons," and also "substantively address recommendations on other measures," including measures on transparency, reducing the risks of nuclear weapons detonations, and increasing understanding of the consequences of such detonations. For more, see this UNFOLD ZERO post, UN re-opens the door to a nuclear-weapon-free world. The significance of the OEWG is that it will stimulate in-depth governmental deliberation on the architecture of a world free of nuclear weapons, keep up the momentum of the humanitarian consequences initiative, and create space for taking next steps. LCNP will monitor and advocate at meetings of the OEWG and submit a paper recommending effective measures. We are very well placed to do so, having coordinated the drafting of a Model Nuclear Weapons Convention described by UN Secretary-General Ban Ki-moon as a "good point of departure" for negotiations. Burns Weston, a distinguished international law scholar, professor of law at the University of Iowa, and member of the LCNP Board, died on October 28. Some of his many accomplishments are recounted in this obituary. He was an important figure in bringing law to bear on nuclear weapons, authoring a seminal 1983 article in the McGill Law Journal, "Nuclear Weapons versus International Law: A Contextual Reassessment," and co-authoring, with Peter Weiss and LCNP Board member Richard Falk, IALANA's model brief used by numerous governments in the 1990s advisory opinion proceedings before the International Court of Justice on the legality of threat or use of nuclear weapons. We were honored by his association with LCNP and will carry on with the work to which he contributed so much.